With the presidential election a few months in the future, 2016 is an appropriately timed exploration of the Democrat candidate’s background, influences, and horrifying vision for America. 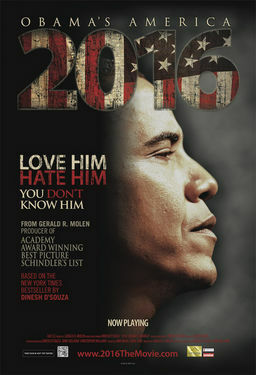 Using logic, evidence, and sound bites from Obama himself, the movie deftly analyzes the man’s past and shows how his family and idols worked to mold his communist ideology. As the film explains, Obama rose to power based not on a well-known plan or solution to the problems instigated by a liberal Congress, but on the color of his skin and empty words about “hope and change”. 2016 aspires to prevent the same travesty from occurring a second time around by exposing the president’s true beliefs, which were largely concealed in 2008. The documentary starts with an exposition of its director’s heritage. Dinesh D’Souza, who previously penned The Roots of Obama’s Rage, was born in India and immigrated to the US in 1978. Having grown up in a harsh and restrictive political atmosphere, he embraced the freedom and opportunity that America offered him. Unlike so many of us, D’Souza never takes his liberties for granted or assumes that a leader is incapable of compromising his people’s rights. After introducing himself, the director poses a question: what is Obama’s dream? Is it the American dream, Martin Luther King’s dream, or is it someone else’s dream? D’Souza then leads us on a journey to witness Obama’s history and see how his literal father and “founding fathers” molded his communist ideology. The film tells us Obama was born in 1961 to an adulterous black father and white mother. Barack’s father was absent for most of his life, leading him to depend on his mother, grandparents, and idols for guidance. We learn that Obama Sr. was an extreme anti-colonialist who sought to expel the white men who were stealing his land’s natural resources. This position differs dramatically from that of George Obama, Barack’s half-brother, who holds that third-world colonized countries grow faster and have better economies that independent ones. George, an author, lives in a hut and reportedly looked to D’souza instead of his brother for financial assistance with his medical problems. Since Obama’s father was never present to rear him, he looked to other people for his instruction and education. These men included unabashed communists Frank Marshall Davis and Robert Unger, Bill Ayers, a terrorist, and Jeremiah Wright, an anti-American black supremacist pastor. As Aesop advised, you’re known by the company you keep, and we should consider Obama’s ideals to be the same as his friends’. Obama’s ideology shows itself not only in his partnerships but also in his actions, which reveal his resolution to downsize America’s position in the world, to reduce America to the level of any third world country. Obama has blocked propositions to create oil jobs in the US, but made deals with Brazil to create similar jobs overseas. He’s made promises to both the UN and Russia that he will disarm America of her nuclear weapons, should he gain more “flexibility”. Obama opposes our ally Israel and sympathizes with our sworn enemy Iran. While the typical Democrat believes in “redistributing” wealth from one American to another, Obama’s vision goes farther. Indeed, the current president views American exceptionalism as a vice, for America only became prosperous by making other countries poor. Not only have the bourgeoisies of America been exploiting their country’s proletariat; America itself is the bourgeois nation of the world, and has long been oppressing the middle-class nations. Obama’s perception of justice is to return America’s stolen profits to the countries she has oppressed. Lamestream media movie critics have been attacking this film for being one-sided and unfair. This is a pathetic complaint for several reasons. First, most of the critics refuse to present an alternative, right-wing side to Obama. D’souza sets out to prove Obama is an anti-colonial statist, and does so flawlessly. Silence is consent in debate, and the critics have conceded 2016’s arguments. Second, reality isn’t subjective or two-sided. A documentary which tries to acknowledge both sides as truth does not truly document anything. Capitalism and communism cannot both be the right economic model. The critics have also accused 2016 of conjuring facts to discredit their beloved king. Regardless that none of these critics present counter-evidence, the evidence given in this movie is quantifiable and verifiable. Obama has driven this country $5 trillion or more deeper into debt over 4 years – fact. Obama has threatened to veto projects like the Keystone Pipeline – fact. Obama has associated himself with ideological traitors to the republic – fact. The man concedes that much in his autobiography, Dreams from my Father, the audio-version of which is used extensively in the film. Finally, the critics repeatedly staple the word “propaganda” to this and any other conservative movie (Act of Valor is a recent example). This does more to expose the stupidity of the critic than the evil of the director. Dictionary.com defines propaganda as “information, ideas, or rumors deliberately spread widely to help or harm a person, group, movement, institution, nation, etc.” 2016 clearly has an inherent political agenda: to create an informed electorate that really knows the candidate of the Democrat party. Thus the movie is propaganda. Is that necessarily a bad thing, though? Clearly not, as American politics depends on propaganda. Without propaganda, no person would be able to express his beliefs and the 1st amendment would not exist. It’s also funny that such critics would denigrate D’souza’s work as “propaganda”, yet praise the blatantly liberal propaganda that conventional Hollywood produces (The Lorax, Wall-E, Happy Feet - all aimed at children, Hitler style). If you’re a conservative or a libertarian, the movie won’t significantly alter your opinion of Obama and you can wait to watch it on the small screen. If you’re a voting-age liberal, on the other hand, waiting for the DVD is not an option. Should you want to cast your vote possessing a true understanding of Obama’s childhood, upbringing, and political philosophy, you must see 2016 in the theater or do similar research in other media. The fate of the country is at risk; which dream will we carry into 2016? Grade: 2016 can't be graded like other movies because it's not "art" in the regular sense. I'll just say that it stands alongside The Dark Knight Rises as the most important movie of the year for posterity. Thirty Dark Zero – This is Kathryn Bigelow’s visual retelling of the Osama bin Laden killing. I personally believe the whole story amounts to nothing more than mythology, but, as the classically educated know, history’s best tales are found in mythology. The teaser tells one just about nothing. Trouble with the Curve – Why are there so many baseball movies now? I’d rather watch Clint Eastwood’s RNC speech than this. Life of Pi – The tiger’s CGI. Flight – Concerns a pilot, played by Denzel Washington, who heroically saves a plane from a devastating crash and sparks controversy afterwards when he’s found to have to been drinking before the flight. Intriguing premise. Boom – When did civilized society start to glorify violence through the “sport” of MMA? While not attempting to defend the current president, I do think it is a distortion of truth to say,"Obama has driven this country $5 trillion or more deeper into debt over 4 years". The truth would simply be stated as,"the national debt had grown by $5 trillion while on his watch." The executive branch may only spend what has been allocated by congress. Yes, Obama is a partner in crime, but the bulk of the guilt must be placed on those who have the constitutional authority to tax and spend.